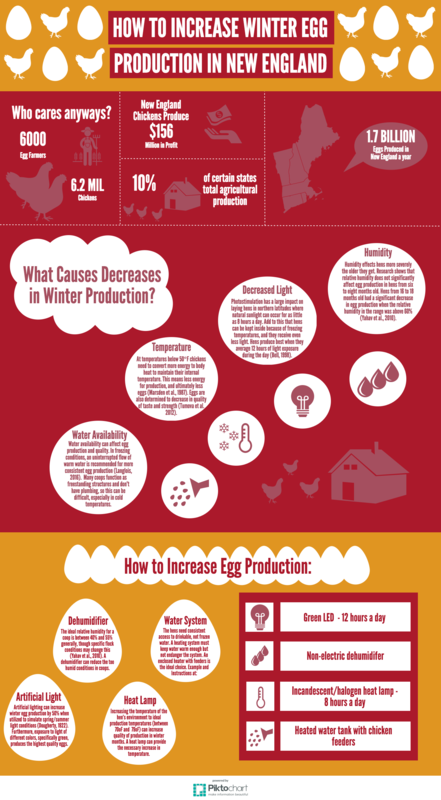 "Increasing Winter Egg Production with Sustainable Technology" by Alexander C. Rawley, Chandler Friend et al. This project addressed the problem of decreased winter egg production for free-range chickens on sustainable New England farms. Interviews with local farmers, farming organizations, and a review of scholarly research revealed that production could be increased with low-cost components that provide optimal heating, lighting, humidity, and water conditions for the birds. Using our system to increase winter egg production will increase farmer profits, ensuring that these farms can continue to provide benefits for food security, local economies, and environmental health.